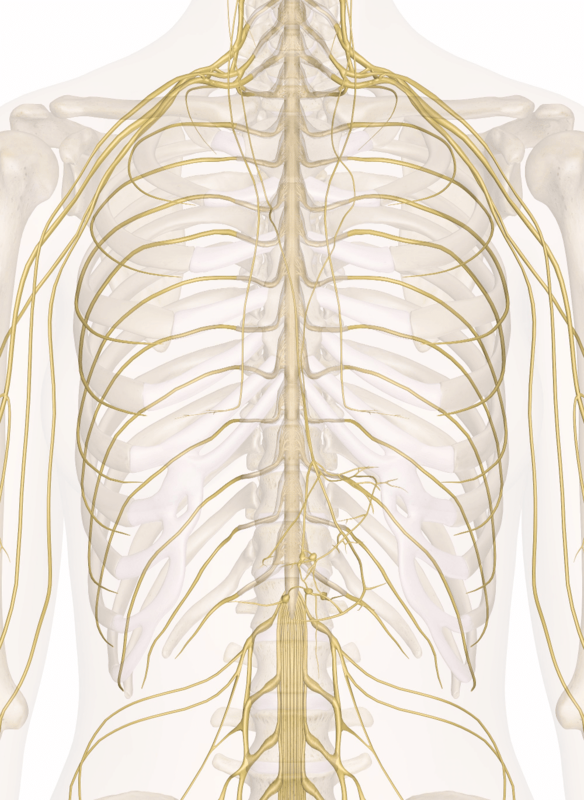 Ever been told by your therapist that “everything is connected?” Tom Meyer has suggested that the body is made up of connections of muscle and fascia termed “myofascial chains.” Recent evidence not only supports the existence of these myofascial chains (Wilke, et al. 2016), but also that force can be transmitted through these connections (Krause, et al. 2016). The myofascial chains that are most strongly backed by anatomical studies are the superficial back line, the back functional line, and the front functional line. The superficial back line is a connection between the following structures: plantar fascia  gastrocnemius (calf)  hamstrings  lumbar fascia/ erector spinae (Wilke, et al. 2016). There is evidence that tension can be transmitted between the plantar fascia and the gastrocnemius muscle (Krause, et al. 2016). The plantar fascia is a large sheet of connective tissue that connects the bottom of the heel to the base of the big toe. Inadequate flexibility of the gastrocnemius muscle can put excessive tension through the plantar fascia, especially towards the end of the gait cycle when body weight transfers to the balls of the feet. Over time, this excessive tension can cause a painful condition called plantar fasciitis. Above are two calf stretches that each target a different muscles (gastrocnemius and soleus), followed by a functional stretch that mimics the phase of gait that demands the greatest elongation of the superficial back line. The Superficial back line is especially important for explosive athletes. The muscles within the chain act synergistically to create propulsion off of a trailing limb when a sprinter explodes out of the blocks. The gastrocnemius acts as a plantarflexor, while the hamstrings and erector spinae extend the hip and trunk. Above is an exercise that challenges the superficial back line in a functional closed kinetic chain position. The back functional line is a connection between the following structures: latissimus dorsi  lumbar fascia  glute max  vastus lateralis, or outermost quadriceps muscle (Wilke, et al. 2016). Studies have shown that force can be transmitted along this chain between the lat and the contralateral lumbar fascia and glute max (Krause, et al. 2016). Tight lats can limit end-range shoulder motion and cause impingement pain. One can maximize tension and stretch in the lats by stretching the contralateral glute at the same time. This will theoretically put the most tension through the myofascial system. Additionally, by taking up tension distally (at your glutes), the lumbar spine is stabilized in a more neutral position throughout the stretch. The back functional line is another myofascial chain that is important for sprinting athletes, and can be thought of as a rubber band from the shoulder to the glute on the opposite side. Through the sprint cycle, the athlete uses the myofascial chain to create tension by stretching the lat with arm movement, and using that tension to maximize glute contraction on the opposite leg. Essentially, by stretching the rubber band proximally (the lats), more tension is produced distally (the glutes), allowing the athlete to move into hip extension as explosively as possible. Above are two exercises that challenge explosive hip extension with maximal tension in the back functional line. The front functional line is a connection between the following structures: pec major  rectus abdominis  adductor longus (Wilke, et al. 2016). Studies suggest that tension can be transferred from the adductor longus and the rectus abdominis (Krause, et al. 2016). Tension in the adductors of a throwers back leg can limit the amount of hip external rotation available throughout his/ her throw. Above is a stretch that lengthens the adductors with trunk movement, similar to the lengthening that must take place during the throwing motion. Be sure to maintain an extended and upright trunk to maximize tension in the abdominals, and therefore through the front functional line. In order to throw with maximum velocity, an athlete must generate energy with the large and powerful lower extremity muscles, and efficiently transfer that energy through the trunk and into the throwing arm1. When an athlete cannot generate or transfer energy in this way, he/ she tends to “over throw” with the upper extremity, leading to elbow and shoulder injury. Myofascial chains may explain how this energy transfer takes place. Above is an exercise that challenges the athlete to generate force through the hips, transfer it through a stable core, and follow through with the upper extremity. The front functional line is activated in its entirety in this exercise – the adductors of the front leg internally rotate the hip to generate power, the abdominals are contracted to maintain a stable and neutral spine, and the pectorals activate to horizontally adduct and internally rotate the throwing arm.